I wandered up to Greenford in North West London this morning to have a look at one of London Underground’s little novelties. Greenford Station, on the Central Line is notable for a couple of reasons – it has the only (working) escalator on the tube network which takes passengers directly from the street level to the platform, which is novel but hardly exciting. What is interesting though is that particular escalator is also the last one remaining on the tube network with wooden slats on the steps. 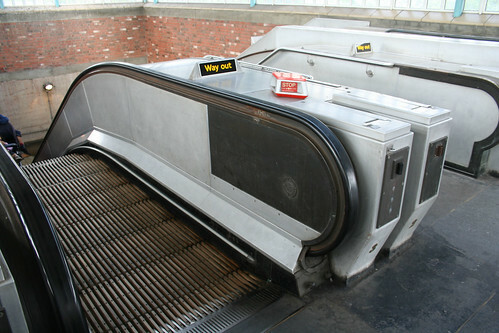 Following the Kings Cross fire, all the old and rather nice wooden escalators were removed as a fire hazard – except the one at Greenford. I presume that as it is not only above ground but also has two static stairs next to it that the requirement to remove it is not a priority. So, today I wandered up to have a look at this last relic, and while it lacks any of the charm of the old 1930s underground stations, there is still enough of the original structure to remind us of the old escalators. There is still the bronzed end plates and the old signs at the top indicating that Otis were the manufacturers. The station itself is also notable for having a split running down the centre of the tube line platforms where an overland train terminates and then returns back down to Paddington Station. A few more photos on my Flickr account. I visited this station today myself, as I’m also interested in the Underground and its history. I thought the layout of the station was very interesting, especially the fact that the platform of this particular Underground is indeed above ground, and of course, the real reason that I ventured this far (in Northwest London, not Northeast as you indicated), the last remaining wooden escalator of the London Underground network. It was left here after the regulations of the aftermath of the King’s Cross Fire deemed that all “subsurface” wooden escalators be replaced with metal ones- and I guess this one didn’t qualify, which is kind of nice. I wonder why they haven’t just replaced it anyway, and if they ever will- it’s probably being kept as a novelty, if nothing else. I’m from Pittsburgh in the United States, and at our Macy’s store downtown, (originally Kaufmann’s), there are a couple of nice, very old, completely intact (sides and all) wooden escalators worth a ride. The Macy’s in New York City has a few too. A Greenford resident writes … As I recall that escalator was supposed to be replaced a few years back (at seemingly vast cost) but the project was canned — probably in the wake of the PPI initiatives. The current plan appears to be to replace it with a lift running up at the same angle (not vertically which apparently can’t be done). From memory the work is due to start sometime next year and is scheduled to take 2 years! Notting Hill Gate had woodern escalators until a few years ago. Was always amazed they’d lasted so long – especially given the fire. 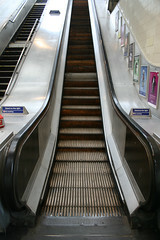 The wooden stepped escalators are due to be replaced in 2015 the new escalator will replace on of the existing two staircases and the existing escalator will be replaced with the first inclined lift on the network. 1 Pings/Trackbacks for "The last wooden escalator"